COLUMBUS, Ind. 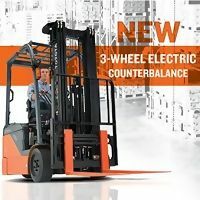 (June 4, 2015) – Toyota Industrial Equipment launched its new 3-Wheel Electric forklift to Toyota’s industry-leading dealer network in Atlanta last month. The new forklifts include 3,000 – 4,000 lb. capacity models with battery compartments ranging from 17.7 to 25.1 inches, and more than 30 improvements to improve performance, efficiency, stability and operator comfort.